The rapid pace of progress in electronics and sensor technology today is determining the level of innovation in mobile machines. The manufacturers and users of agricultural and forestry, construction and mining machinery as well as special and municipal vehicles are harnessing the potential of intelligent sensors. Processes are becoming more efficient, more precise, and more environmentally friendly. This development makes SICK an important partner in achieving highly automated to autonomous mobile machines. SICK can draw on the broad range of technology it offers as well as its experience in the automation of machines and vehicles. The range of mobile solutions for material flow within factory buildings extends from cellular conveyor systems and pallet shuttles to freely navigating automated guided vehicles, VNA trucks, indoor cranes, and special vehicles. Moreover, solutions for mobile outdoor applications, where changing weather conditions are a primary concern, or for applications below ground are not a new challenge for SICK sensors either. They have been proving their worth for many years in ports, mines, and many other demanding environments. 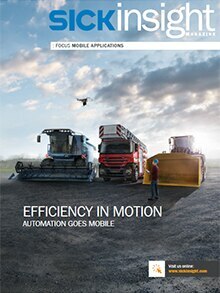 Sensors such as encoders, inclination, proximity and ultrasonic sensors, as well as pressure and level sensors, are the basis of numerous positioning and detection tasks in mobile machines. Caution on the apron: The APS driver assistance system from SICK means costly accidents and collisions during aircraft ground handling can be avoided. The APS monitors the towing corridor, shows drivers any obstacles, and warns them of possible collisions in good time. Driver assistance systems providing contour guidance and collision awareness take the pressure off operators. Thanks to intelligent sensors with integrated application software, the recorded raw data and the vehicle data are directly evaluated by the sensor. The LD-MRS 4-Layer UAV 3D LiDAR sensor connected to the drone demonstrates a very large working range of 300 m despite its lightweight design. Even with black objects (10 percent remission), its working range is still 50 m.